Le Club AccorHotels has launched new promotion for Air France-KLM Flying Blue member stays between October 1 – December 31, 2017. Flying Blue members can earn triple miles for up to THREE stays during the promotional period if the stays are booked between August 24 – Sep 30. Note that you must have your Le Club AccorHotels earning preference set to partner points/miles and have Air France-KLM Flying Blue chosen as the preferred partner. All the existing points that you may have in your account are swept to Flying Blue miles if you enable this option. Le Club AccorHotels loves these promotions that requires members to book far in advance prior to your intended stay (they never work for me). Also, these airline bonus promotions don’t work for those that have Le Club AccorHotels points in their accounts that they don’t won’t to convert. 1. 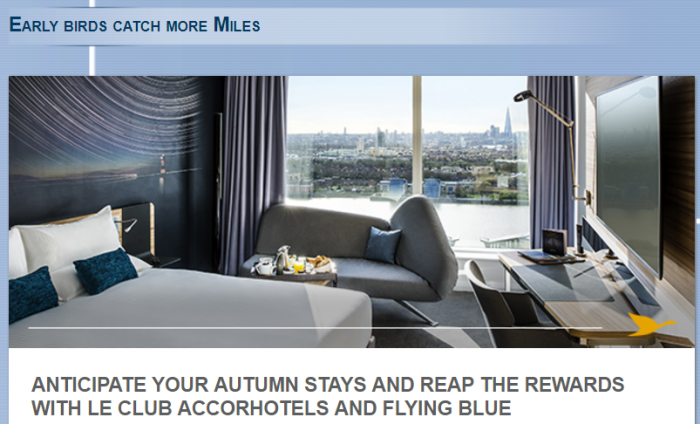 The Le Club AccorHotels terms and conditions apply to the Early birds catch more Miles offer and you must be a Le Club AccorHotels member to take advantage of the offer. 2. This offer entitles Le Club AccorHotels members, regardless of their status, to earn triple Rewards points on their stays in a Le Club AccorHotels loyalty programme participating hotel. This Rewards points bonus is offered in addition to the Rewards points and Status points that are usually earned by the Le Club AccorHotels member on completing an eligible stay in accordance with the Le Club Accorhotels General Conditions of Use. This promotion does not apply to stays in Le Club AccorHotels partner hotels. The number of Rewards points earned via this offer are calculated based on the number of points earned by a member with Classic status. In order to benefit from this offer, the member must have activated Flying Blue as their preferred automatic conversion option ahead of the stay. This option must remain activated until the Rewards points related to the stay have been credited to the member’s Le Club AccorHotels account. 5. All consecutive stays (check-out and subsequent check-in on the same day) in the same hotel will count as a single stay. The Early birds catch more Miles offer only applies once to each stay. 13. Please specify the reference 50233 in all your communications with AccorHotels call centres or the Customer Care team related to this offer. Each member can only use this offer 3 times during the validity period. In order to be eligible for this offer, you must first of all sign up for the Early birds catch more Miles offer prior to making a booking. Previous articleHorrible Lineups At Airport Of Thailand’s Immigration Checkpoints – Overwhelmed Or Negligent? Next articleAre Chinese Customers Growing Tired Of Shabby Treatment By Their Domestic Airlines?